Lead screening is required in New York State for children at age 1 and age 2 as they are the most vulnerable population for lead poisoning. Children under age 6 are also at risk for lead poisoning. Was your house painted before 1978? 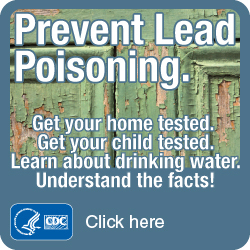 Protect your family from lead exposure. Remodeling the home? Renovate right with lead-safe work practices. * Follow-up home visits to families whose child has a higher than normal lead level. * Referral for environmental evaluation by the NYS Department of Health District Environmental Office as necessary. * Education to increase awareness regarding lead in our environment, measures to reduce exposure and nutritional guidelines. Wash hands with soap and water after playing in soil, before meals, naps and bedtime. Wash toys that are housed near the home's foundation. Is Your Child Safe from Lead Poisoning? In this podcast, Dr. Mary Jean Brown, chief of CDC's Lead Poisoning and Prevention Program, discusses the importance of testing children for lead poisoning, who should be tested, and what parents can do to prevent lead poisoning. Created: 10/2/2008 by National Center for Environmental Health (NCEH). Date Released: 10/2/2008. Series Name: CDC Featured Podcasts.